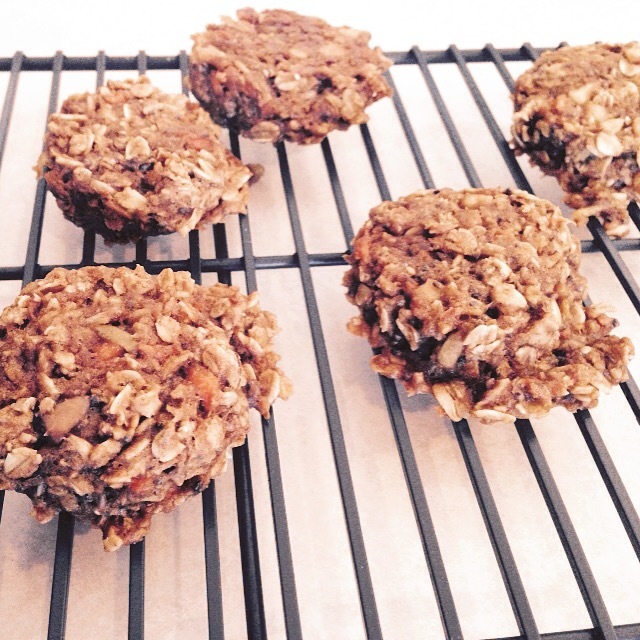 I added to my mom’s oatmeal cookie recipe to create a yummy, portable and healthy cookie for anytime of the day. Pcakes, pup-pup (raisin free) and adult approved. These are perfect for a toddler and mommy snack on the go! Pcakes isn't a huge fan of muffins, but these seem to be just the right size and texture for her to eat anytime of the day. Place about 2 dozen scoops on baking sheets. Bake until firm and browned, about 15 minutes. 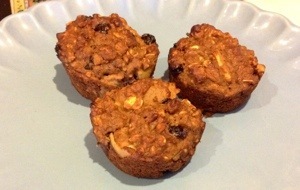 I made these quick muffins and recovery drink to have on hand after my intense MommiesRfit Bootcamp workouts and after my training runs. (As Tony says, “The recovery drinks, that’s why I do the workouts.”) The muffins are about 50% carbs and 20% protein, the drink 100% carbs, (49 g carbs, plus sodium,potassium, and vitamins). 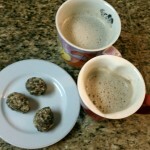 A serving of the drink and one muffin total just about 300 calories. Mash bananas, add all other ingredients, stir with a wooden spoon, add splash of coconut water or non dairy milk if too dry. (Should be able to spoon mixture into muffin tin). Bake about 20 minutes, or until browned and a toothpick inserted in center comes out clean. To celebrate what feels like the start of Summer in VA, I whipped this up in the blender after a balmy 85 degree morning in the sun. Yummy and refreshing, it gets a whipped froth on top from the canned coconut milk. Add pineapple, coconut milk, banana and protein powder to blender. Blend, adjust with water or ice to get preferred consistency. I’ve had clients and friends use this ‘recipe’ for their whole families; as a quick breakfast or yummy lunch on the run, for kids before games, active teens, sick elderly relatives etc. 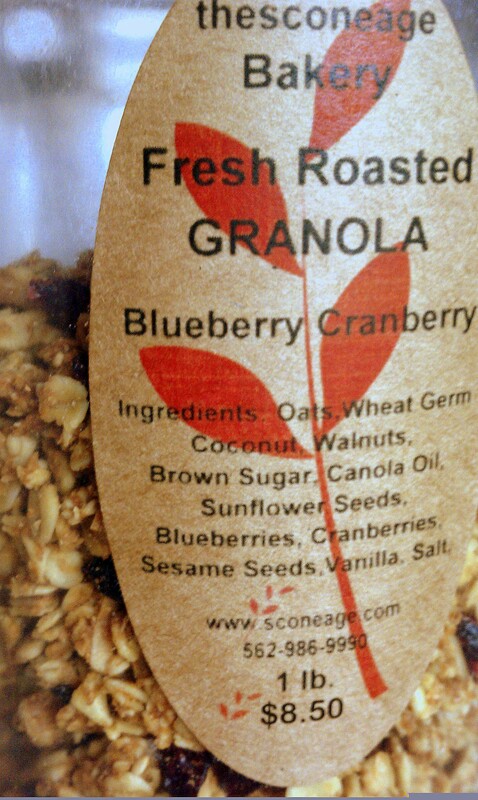 This is just a variation of our favorite, beneficial ingredients. You can read more about why I like this protein powder here. This is an awesome milk shake for those looking to gain weight, supplement nutrition or as a meal replacement. Also great for kids and teens. Blend until thick and creamy. You may need to adjust by adding more Almond milk or frozen bananas. 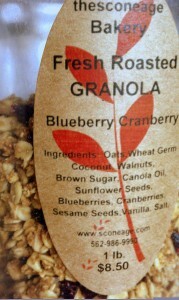 Sorry folks I can’t seem to find the pictures…you know what a yummy scone looks like though, right? I’ll just have to make them again soon. Can you hear AJ lamenting? Mmm Pumpkin Scones with spiced drizzle! Combine all dry ingredients. Add butter and use a fork to cut into the flour mixture. You want a crumbly texture like fine sand. In another bowl, whisk together the pumpkin and milk. Fold into dry ingredients,make a dough ball. On lightly floured large cutting board, form ball into large rectangle. Cut into 3 pieces. Then cut these into 4 so you have 12 total triangular pieces. Place on a baking sheet sprayed with oil. Bake for 15-20 minutes, or until slightly browned and interior done (test with toothpick). During Farmer’s Market season, AJ and I love to get up on a Saturday morning and head over to downtown Warrenton. We stop into Great Harvest Bread company for a cup of coffee and then walk over to peruse the tables of fresh local produce. If you haven’t ventured into Great Harvest yet, go take a peak. You’ll be happily greeted by the friendly employees and enveloped in the warm and heavenly scent of baking bread and goodies. Then, you’ll be asked what you would like to sample. Now they say “sample” but many times that means a full size slice of peach cobbler bread or huge broken bits of molasses or pumpkin cookies or butterscotch chip scones. Or maybe a little of each. Yum. We’ve also purchased a few muffins and scones on occasion which are yummy but super sweet. Get a cup of black coffee with them. Muffins and Coffee before an early morning hike. "Gotta move my feet AJ! Weeeee..."
It’s made with their yummy flour, spinach, honey, yeast, sea salt, feta, eggs from free range hens, garlic, oregano and black pepper. The packaging says there are about 18 servings in the loaf and each one has about 120 calories and 3.5 grams of fat. We ate it in about a week so I think our servings were more than 2 oz. however. Now the good stuff. My mother and AJ will confirm, I am very particular about bread. I never was one for subs or sandwiches as a kid and I rarely eat them as an adult. I like a good artisan bread with a crusty outside and I usually toast it so every surface is browned and slighly crisp with a good soft chewy interior. And it must be warm. 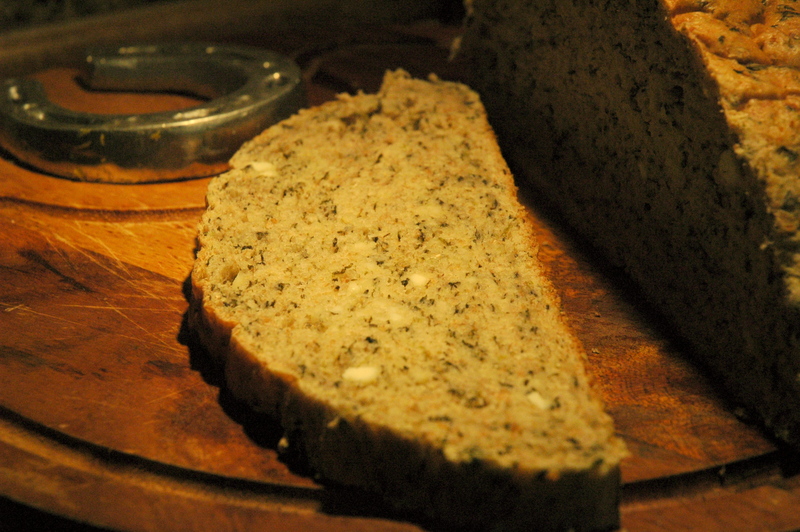 I served it on the side of soups and salads and tried it toasted with eggs for breakfast. It was scrumptious in every application. 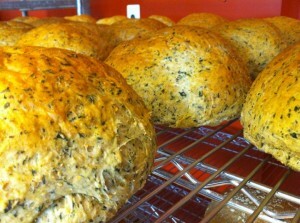 Wednesday is Spinach Feta day so go grab a loaf, they go fast! A quick and healthy breakfast that will fill you up and is ready in 1-2 minutes. I make a few jars at a time and stick in the fridge/lunchbox for the next few days. Done and done. I keep a ready supply of frozen ripe bananas in a ziplock bag. Feel free to use the one on your counter, just mash well. I save all my glass PB, Brown Rice syrup etc. jars and reuse them for overnight oats. 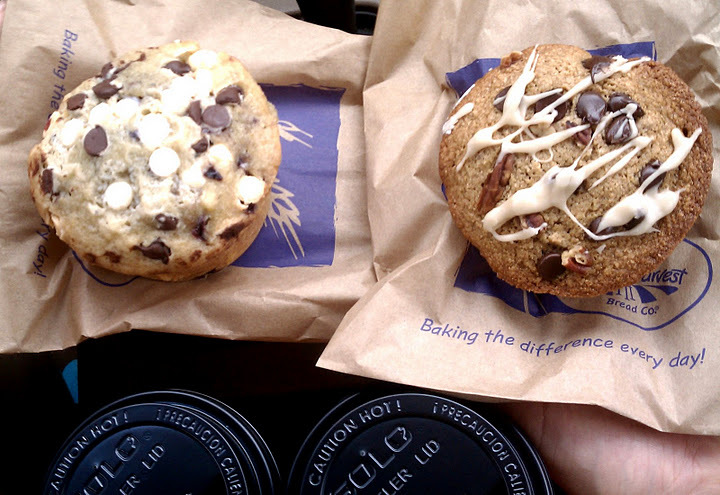 The possibilities are endless, try with a sprinkle of chocolate chips or a swirl of peanut butter. Stick banana in jar, microwave 20-40 seconds or until melted. 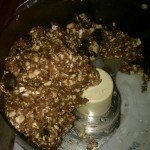 Add oats, spices, vanilla, Chia seeds, raisins, sweetener, and enough milk to cover. Stir, taste, adjust seasonings & sweetener. Put on lid, stick in fridge overnight. Add more liquid if needed. Eat as is or microwave for 1½- 2 minutes. OH MY GOODNESS this is good. Known the world over in Raw & Vegan circles, “Raw Cookie Dough” is amazing. 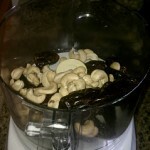 Try my version for a quick fix to your sweet tooth and comment what you think! To taste like actual dough, get good quality dates like Medjool. I've tried Sun-made and Amport "chopped dates" and they didn't work quite as well, but still tasted good. The high quality get processed very smooth and become like brown sugar whereas the Amport and Sun-maid remain a bit chunky. I buy good quality Medjool dates at Costco in the produce section, usually by the pineapples and melons. 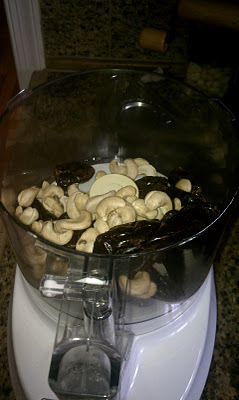 In the food processor, blend the dates, cashews, and vanilla. 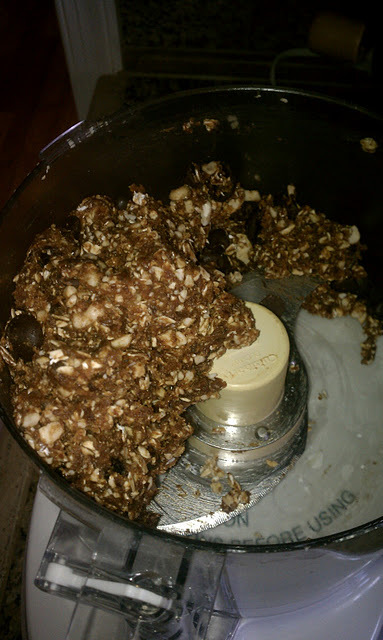 Add the oats, sea salt and chocolate chips and give a final whirl to stir in. (If too dry add a almond milk by the teaspoon). 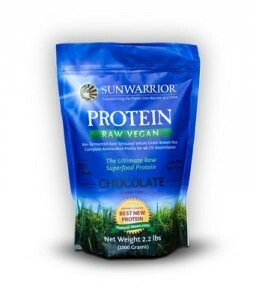 Healthy Protein Powders: a review of Sunwarrior, NutriBiotic, Living Fuel & Now powders. 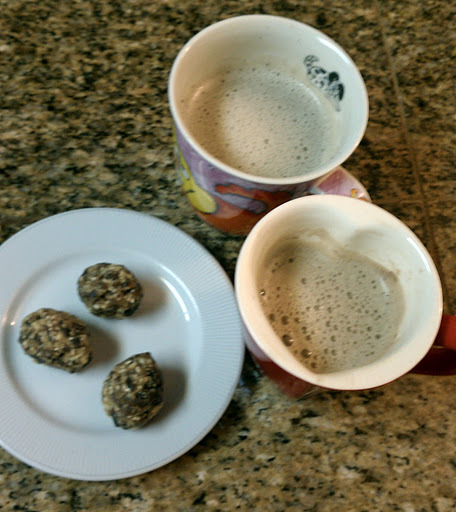 Try one in my Mocha-Flax Protein Shake recipe! There are so many types of Protein Powders on the market, it can be overwhelming to decide what is best for you. You want something easy to digest, as your body uses the amino acids in protein to continuously rebuild enzymes, tissue, hormones, and other important molecules. Did you know most protein powders are created using chemical extraction? Many protein powders have been mechanically separated, heated to high temperatures, and processed using chemicals like hydrochloric acid and sodium hydroxide which can damage the amino acids like immunoglobulins (antibodies), and glycomacropeptides (help calcium absorbtion & boost immune systems). Just like with any food, the closer to the original form it is, the healthier, more nutrient rich and cleaner burning it is for your body. Something that tastes great would be nice too, right? In this post I have reviewed and pooled information on some great products that will help make your protein powder choosing easy and tasty! Sunwarrior makes awesome stuff. All their proteins have 98.2 assimilation rate and are about 83% protein. One scoop of the chocolate is 15g of protein, 80 calories, 1 g of fat, 5g of carbs and only 1g sugar. And it’s YUMMY! I love it in my Mocha-Flax shakes (below) or just mixed until creamy with 1/4 cup almond milk like a protein pudding (or heat for 10 seconds and its like a warm pudding mouse mmm). Ingredients: Whole brown rice protein (Bio-Fermented Raw Sprouted Whole GrainBrown Rice Protein), Cocoa, Pectin, Xantham gum (Natural Bio-Fermented Stabilizer), and Stevia (all natural plant-based sweetener). Sunwarror is our favorite. So much so, that I joined their affiliate program. If you’d like to order some, you can find it here. NutriBiotic kindly sent me a full size 22 oz. of their Nutritionally Balanced Drink Mix. “NutriBiotic’s naturally flavored Vegetarian Vanilla Bean ProZone is more than a supplement or “meal replacement” product. 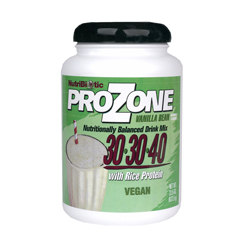 ProZone is formulated to contain the performance enhancing and healthy living balance of essential macronutrients: protein, fat, and carbohydrates.” 1 serving has 14g protein, 184 calories, 6g fat, 19 carbs, and 12g sugar. Ingredients: Enzymatically processed rice protein from whole grain, sprouted brown rice; pure crystalline fructose; medium chain triglycerides; natural vanilla flavor; guar gum; and xanthan gum. We thought this was pretty tasty and blended fine. When I tasted the first time I had to re-read the label to reassure myself it really was all natural vanilla and sugar as it tasted so sweet…we now tend to mix in a quarter to a half scoop of plain Pea or Rice protein with this one to cut the sweetness. 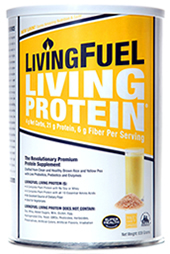 Living Fuel graciously sent me their full-sized can of their Living Fuel, “A revolutionary Protein and Fiber Formula derived from healthy plant sources, with 21 grams of protein, 6 grams of fiber, probiotics, prebiotics, and enzymes”. I definitely think Living Fuel is on to something including their own natural sweetener blend and pro&prebiotics in all of their products (they also make the CocaChia bars and snack mix). 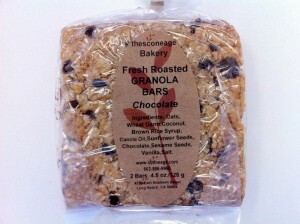 A serving has 21g protein, 140 calories, 4g fat, 10g carbs, and 1g sugar. 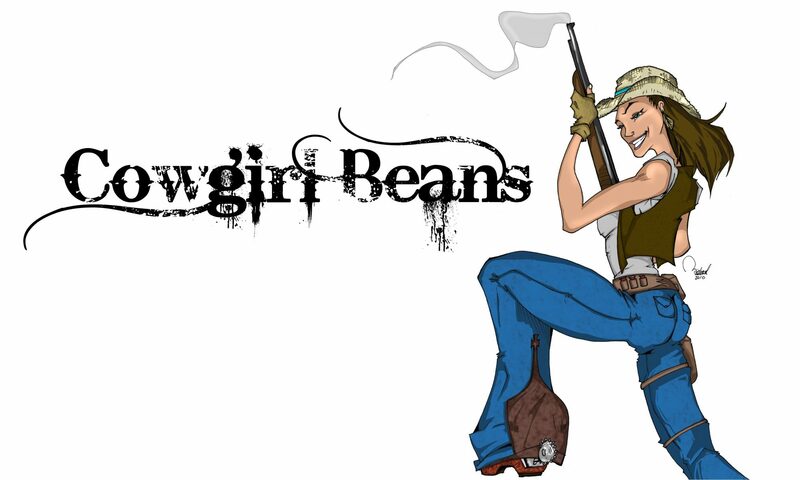 Ingredients: Enzymatically and Mechanically Extracted Protein from non-GMO Organic Brown Rice & non-GMO Yellow Pea Proprietary Complex, Stabilized Brown Rice Bran, Xylitol (from organic hardwood trees), Natural Fructooligosaccharides (FOS), Mannitol, Organic Vanilla Extract and Stevia Proprietary Complex. This is a great product with healthful, naturally derived ingredients but must be mixed with something else (unlike the Sunwarrior which is great on its own) because of the flavor or lack thereof. Pea protein can tend to have a chalky mouth-feel and unpleasant play-dough smell and taste, so just mix it in the blender to make a fruit smoothie and you won’t notice! 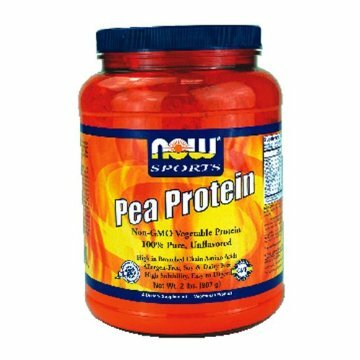 This was one of the first vegan protein powders I bought and I still have some left…like I said above, unflavored Pea protein has a distinct taste and smell so I don’t use it by itself. I usually mix this one with the vanilla or put small amounts (1/4-1/2 scoop in bars, oatmeal etc.) It has 28g protein, 130 calories, 2g fat, 1 carb, and 0g sugar. Ingredient: 100% Pure Non-GMO Pea Protein Isolate[from yellow peas (Pisum sativum)]. 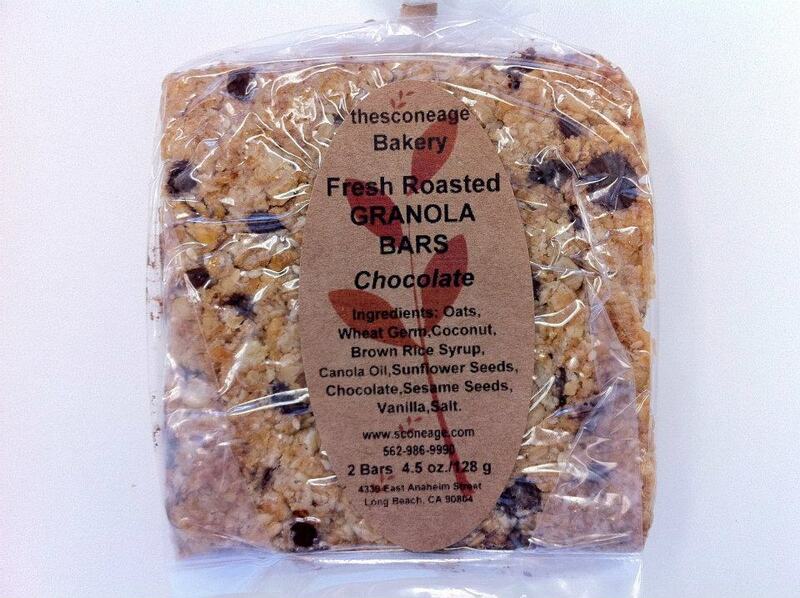 Allergen-Free. Blend, add more liquid or ice as needed until creamy and milkshake-alicious!